People travel from all over Northern New Jersey (and some even from New York) to spend Shabbat with us, and SHAMMAI ENGELMAYER is why they do. It's because of the ruach (spirit) he exhibits and brings out in the rest of us. He is down-to-earth, accessible, and believes other people know more about certain subjects than he does. It's just that he knows more about Judaic subjects than most of us. He is happy to share that knowledge, which makes us happy. And he takes time to make things understandable, which makes us even happier. Take the Torah service on Shabbat mornings. In our shul, it has gone from being one of the most boring segments of the service to arguably the most popular segment. Not only does Shammai prepare study questions to be discussed during the reading, he hands them out a week in advance to give us a chance to think about them and come up with our own answers. Then he encourages us to share those answers with the rest of the congregation. For this week's questions, click here. People relate to Shammai because Shammai relates to them. Shammai wears several hats—literally and figuratively. He is our rabbi; he has been writing an award-winning column, "Keeping the Faith," for The Jewish Standard newspaper since the early 1990s (so far, he has won six American Jewish Press Association awards) click here to surf over to the newspaper’s website to read his latest column); and is the editor of Judaism: A Quarterly Journal of Jewish Life and Thought (the journal, published by the American Jewish Congress, is on hiatus at the moment). Most important, he is among Northern New Jersey’s most popular instructors of continuing adult Jewish education. 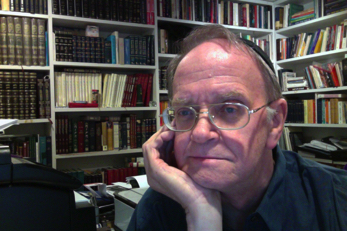 A product of the yeshivah world, Shammai was ordained in 1967, but chose to pursue a career in journalism before assuming the pulpit, winning several prestigious journalism awards (including the Washington Journalism Center's Thomas L. Stokes Award for National Reporting, and the National Association for Justice's Media Humanitarian Award). He is the author of eight books, most on secular topics, and is at work on three more. He has three children and 10 grandchildren. Seventeen years ago, our rabbi met Dr. Frederik Paulsen, chairman and CEO of an international pharmaceutical company headquartered at the time in Copenhagen. The two men had significant philosophical discussions over the next couple of years. Then, one day, Dr. Paulsen, who is not Jewish, called Rabbi Engelmayer and asked him to help craft a philosophy for the company that would reflect the Paulsen family’s own values. The result was “The Ferring Philosophy,” which was unveiled 11 years ago. Today, “The Ferring Philosophy” appears on entry walls in Ferring facilities worldwide, is the first thing employees see when they turn on their computers each day, and is among the first items handed and explained to new hires. In December 2014, Ferring opened its headquarters for its U.S. affiliate, Ferring USA, amid great pomp and festivity, and a very impressive guest list of Nobel Prize winners, distinguished internationally recognized scientists, government officials, and others. Rabbi Engelmayer was invited to deliver the keynote address at the ceremonies. His address, seen in an accompanying film, is bracketed by comments about Rabbi Engelmayer’s effort by several Ferring officials. We are proud to present our Rabbi on this prestigious international stage. Click on the video screen above to view.